Graphically, the game is very appealing and the game play is somewhat challenging. You dodge a barrage of eggs, asteroids and treasure chests as you work you way to battle the various bosses of the game. Ship navigation can be a little tricky but overall, Chicken Invaders 3 is worth giving that trial version a go. The storyline of Chicken Invaders 3 has intergalactic chickens invading Earth, seeking revenge for the oppression of their earthly brethren. Colonel Sanders is in big trouble! Your job is to take the fight to space and defend the planet and our ability to enjoy a bucket of extra crispy. The Main Menu with Chicken Invaders 3 has options to launch the game or view the gaming options. Game options include controls choices, graphics levels, sound, language and access to local leaderboards. The one glaring item missing from the options menu is a help screen. It's not a complicated game to figure out but some aspects take a bit to understand. When you go to launch a game, you'll first see an options screen where you can continue a paused game or start a new mission. When you start a new mission, you choose which gaming level you want to compete at (rookie, veteran, superstar hero). You can also view your career achievements from this screen which includes medals, statistics and unlockables earned. Once you set your game options and are sent into the game, you'll run through a series of story boards (you can advance by tapping the screen) to eventually get to the gaming screen. The layout of the gaming screen has your score and weapons status in the upper left corner. In the lower left corner are your vital stats including lives, bonus missiles, and chicken parts collected. There is a lightning bolt that I have yet to figure out what it measures. The object of the game is simple, blast the chickens and other obstacles out of the sky. You can move your ship by one of two ways (set in the options). You can choose the drag setting where you tap, hold and drag your ship around the screen. There is also the tap setting where you tap the screen where you want your ship to move to. With the tap setting you end up dragging your finger around so I found choosing the drag setting works the best. One quick observation on moving your ship is that at times your finger gets in the way. You've got to get used to the movement controls and having your finger in the middle of things, but it doesn't take long. Firing your ship's weapon is accomplished by tapping the screen. You also can rapid fire by tapping/holding the screen. As you fire your weapon it will begin to heat. The weapons status in the upper left corner is a bar meter that increases as your weapon starts to overheat. If your weapon overheats, you'll have to wait a few seconds for it to cool down before you can resume firing. The chickens come at you in waves flying into the gaming field much like the aliens do in the game of Galaga. Once they line up in formation, they will begin to drop eggs. While you can blast the chickens into oblivion, you can not shoot the eggs. The challenge with the eggs is that they are a) slow moving and b) so small they often blend in with everything else that is going on. This makes them easy to forget about and easy to fly into. Periodically, you will face challenges other than the chickens such as an asteroid field and a barrage of treasure chests. You will also find weapons boosts fall after you blast a target that will give your weapons system a nice little spark. Along with your main weapons system you also have the opportunity to earn bonus missiles. These missiles will launch from your ship and destroy everything that is on the screen. How do you earn these missiles? When you take out a chicken, they explode into fried chicken pieces and chicken sandwiches. Collect fifty of these chicken parts and you earn a bonus missile. All in all, I liked Chicken Invaders 3. You have an arcade game with quality graphics and plenty of challenges. The transitions between levels/stages can be a little on the lengthy side and the lack of a help section can be a little frustrating. There is a free trial version available for Chicken Invaders to let you try before you buy it. If you're a fan of arcade games, Chicken Invaders 3 is well worth a try. 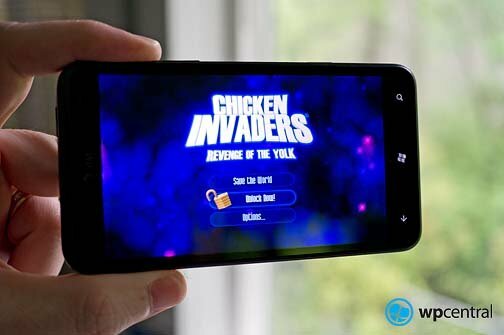 The full version of Chicken Invaders 3 is running $2.99 and you can find it here at the Windows Phone Marketplace.